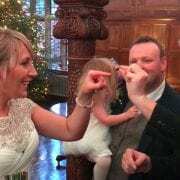 Staffordshire Wedding Magician Owen Strickland at Pendrell Hall. Today was another Christmas Wedding, this time for Chris and Amanda. Pendrell Hall is a venue that feels extra special at Christmas, with a huge and lovely tree.